Vēsturiskas stilizācijas festivāls-karnevāls par godu pavasarim un Rīgas labākā aizstāvja izvēlei! Bruņinieku turnīri par Maija Grāfa titulu - piedalās ikviens rīdznieks! Labākās vēsturiskā tērpa stilizācijas konkurss "Modernā Renesanse 2016"
Mākslinieki, aktieri, mūziķi, dziedātāji un dejotāji - vēsturiska pasaka atdzist Vecrīgas ielās! Festval program 10:00 A.M. 0 10:00 P.M. Become to a best warrior of Riga! Tournament participants age limit - 7 to 17 y.o. There in no age limits. All you need - your historical costume to take a part in one of the nominations. At the "Count of May festival" also May Fire fest will took place. unique Riga spring carnival for whole family! With the first warm sun rays an unique Riga tradition is brought back to life. You will see at the streets brave knight and ladies in historical carnival costumes, fun medieval attractions for children and adults, songs and dances, and a knight tournament in honor of Count of May title! Who will win this year’s title of the best defender of Riga, and the opportunity to name your beloved lady the Countess of May? The festival of Count of May arrived from Germany, Scandinavia, Gotland and England, where they were celebrated as spring festivity during Middle Ages. The Count of May, who symbolized the spring, would come into towns and villages with his entourage. The first mentioning about the Count of May celebration in Riga dates back to 15th century, when the count of May was elected in presence of the town council on a stretch of an open space outside the city. The person who won the title of Count of May could keep it for a year, and it was always someone from The Great Guild. The participants of the celebration would go on a festive procession to the Great Guild, where a luscious feast took place. Today Count of May is based on historical traditions with many new modern multicultural and innovative tendences. Now it is bright carnival for all family, all participants are welcomed in historical or fantasy dresses. Any of historical ages between X and XIX century is welcomed, as well as fantasy dresses like Game of Thrones etc. Rhis unique spring festival is for new spring coming, new joy coming into our life. Be creative, be fantastic - be with us! Entrance is for free - all day long. 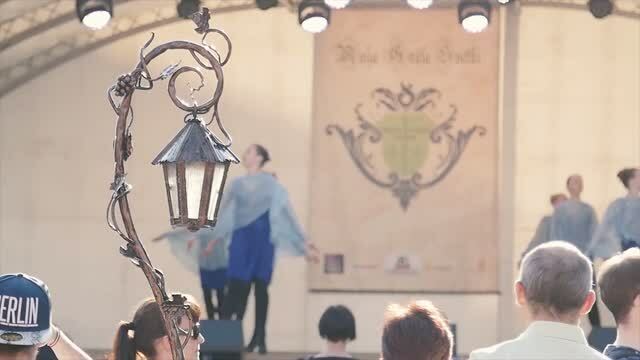 • Child knight tournament "Roland cup 2019"
• Best costume contest "Modern Renaissance 2019"
Organizē: Kultūras biedrība "Alternatīvā Realitāte"